The cloud may offer more convenience, but, if you want to store lots of content, you can't really beat a good old fashioned hard drive. The new 12TB options from Seagate, which are part of the BarraCuda Pro, IronWolf and IronWolf Pro lines, are a perfect example of this, packing a ton of space at a pretty reasonable cost. The 12TB BarraCuda Pro is designed for desktop users, being touted as the "fastest, highest-capacity and most reliable hard drive" that consumers can get right now. The IronWolf and IronWolf Pro, on the other hand, are optimized for NAS use. "Our storage hungry customers and partners continue to ask for our latest and greatest technology along with increased capacity and performance in our purpose built products," says Seagate Technology senior vice president of Business Marketing Matt Rutledge. "With the 12TB Pro products, Seagate buyers are overcoming capacity constraints in their systems and can access vast amounts of digital data anytime, from anywhere." 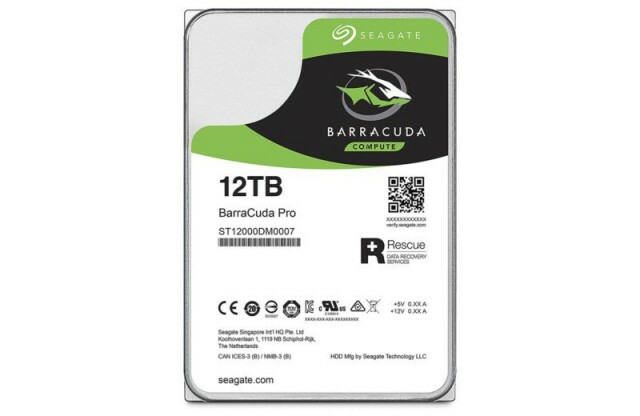 The 12TB BarraCuda Pro, which is available in a 3.5-inch form factor, is a 7,200RPM drive with 256MB of cache and a transfer speed of up to 250MB/s. There is a five-year warranty offered, with two years of Seagate Rescue data recovery thrown in. It costs $529.99. The 12TB IronWolf and 12TB IronWolf Pro are also 3.5-inch drives, and they are offered with IronWolf Health Management software, which is compatible with different NAS devices from the likes of Synology and QNAP. IHM comes with features such as actionable prevention and includes recovery options. IHM will not be available right away though, as Seagate says that this software will be available "within the next quarter" with its partners in the NAS space. The MSRP for the 12TB IronWolf is $569.99, while the 12TB IronWolf Pro comes in at $539.99. Seagate says that all new drives are currently shipping across the globe.